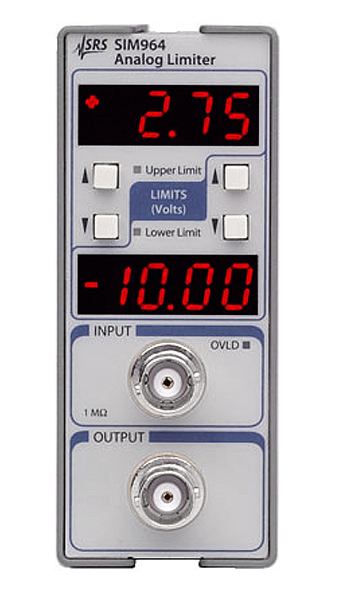 The SIM964 Analog Limiter provides upper and lower voltage limits for conditioning dynamic signals. Limits are set between ±10 V with 10 mV resolution. Two rear-panel TTL signals are activated when upper or lower limits are exceeded. The SIM964 uses SRSs clock-stopping architecture design to eliminate digital noise artifacts. The low output noise and low harmonic distortion of the SIM964 make it ideal for many applications. Limit detect TTL level signals (rear-panel BNC connectors) are high when upper or lower limits are exceeded.